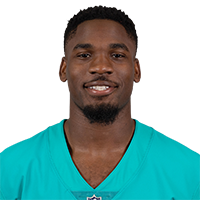 Analysis: A 2016 fourth-round pick, Louis made 12 starts in 32 games his first two NFL seasons, catching 45 of 96 targets (47 percent) for 562 yards (5.9 YPT) without any touchdowns. He then spent the entire 2018 campaign on injured reserve due to a neck injury, missing out on a chance to experience competent quarterback play for the first time in his pro career. Louis should find another opportunity to compete for a roster spot if he's able to gain medical clearance from the neck injury. Analysis: Louis had neck surgery last summer and was never expected to play in 2018. It isn't clear if the 2016 fourth-round pick will be able to resume his football career, as the Browns haven't provided an update on his progress. If he does end up playing, Louis will face tough competition for a roster spot on a team that now has Odell Beckham, Jarvis Landry, Antonio Callaway and Rashard Higgins atop the depth chart at wide receiver. Analysis: Louis' placement on IR comes as no surprise after it was announced he needed surgery on his neck. His 2018 season comes to an end early on. He'll be looking to recover and return to action in 2019. 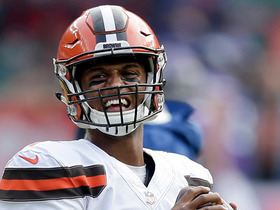 Analysis: Given the often career-threatening nature of neck injuries, it's unsurprising that the Browns quickly decided to rule Louis out for the next several months. Louis' role was likely to decline in 2018 with the addition of Jarvis Landry, but the injury now further dims his outlook with the Browns moving forward. He'll enter the final year of his rookie contract in 2019. Louis, who failed to make a catch on two targets during Cleveland's Week 17 loss to the Steelers, finishes the season with 27 receptions for 357 yards. Analysis: Louis set career highs in receptions (27), targets (61) and yards (357), but ended the season as the Browns' fourth wideout behind Josh Gordon, Corey Coleman and Rashard Higgins. He hauled in just one pass over the final six games of the season, and will most likely have to battle for a roster spot in 2018. Louis played just four offensive snaps and finished without a catch or target during Sunday's 27-21 overtime loss to Green Bay. 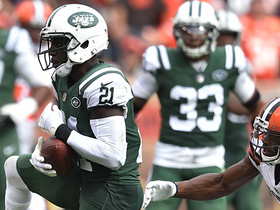 Analysis: Josh Gordon and Rashard Higgins have jumped past Louis on the depth chart, so much so that the second-year pro out of Auburn is having a tough time finding the field. The 23-year-old has just one reception over his past three games, and Sunday marked his second straight game without a target. Coach Hue Jackson has been fluid with his wide receivers all year long, so there's still hope Louis gets involved again, but his involvement would be limited to the No. 3 wideout spot if that should happen. Louis wasn't targeted in Sunday's 19-10 loss to the Chargers. Analysis: For the second straight week, Louis ended Sunday's contest without a reception, but unlike in Week 12, he wasn't targeted. He had already been losing out on snaps to Rashard Higgins, but now with Josh Gordon back in the mix, Louis had an even tougher time finding the field. The 23-year-old played just 12 snaps against the Chargers, which could be a trend for the remainder of the year. Louis was held without a catch (two targets) during Sunday's 30-16 loss to the Bengals. Analysis: Louis has been the main victim of Corey Coleman's return from injured reserve. Since Coleman made his way back to the lineup, Louis has been able to haul in just a single catch on six targets. Not to mention the fact that Rashard Higgins also played more snaps than him for the second straight week, and with embattled receiver Josh Gordon set to make his season debut Sunday, Louis' production and field time should continue to fall dramatically. Louis caught just one pass on four targets for 15 yards during Sunday's 19-7 defeat to the Jaguars. 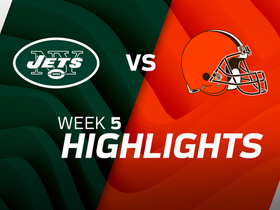 Analysis: Louis definitely didn't benefit from Corey Coleman's return from injured reserve, as the 23-year-old's lone catch was his lowest total since Week 3. Meanwhile, Coleman saw a team-high 11 targets. Coleman's presence on the field should, in theory, draw coverage away from Louis, though that didn't seem to be the case Sunday. In fact, third-string wideout Rashard Higgins actually out-snapped Louis, and although Higgins failed to make any catches, it'll be interesting to see if this becomes a trend. Louis caught two passes (six targets) for 15 yards during Sunday's 38-24 loss to the Lions. Analysis: Louis played 74 percent of Cleveland's offensive snaps, though he had a tough time getting in sync with DeShone Kizer (ribs). The 23-year-old accumulated his lowest receiving yards since Week 3, and has hauled in just four of his last 12 targets. He still remains the Browns' No. 1 wideout, and with the way Kizer looked on Sunday, bigger things could be on the way for Louis. 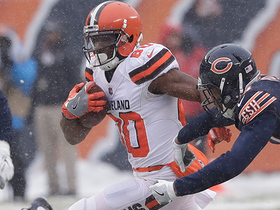 Cleveland Browns quarterback DeShone Kizer throws to wide receiver Ricardo Louis for a 35-yard completion. 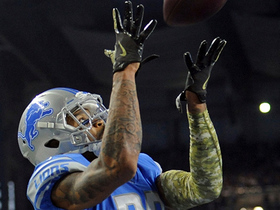 Detroit Lions cornerback Darius Slay seals the teams win after intercepting Cleveland Browns quarterback DeShone Kizer in the end zone. 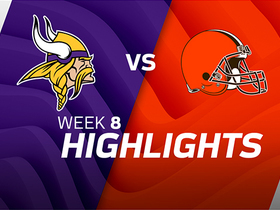 Cleveland Browns quarterback DeShone Kizer drops a sideline dime to wide receiver Ricardo Louis vs. the Minnesota Vikings in Week 8 of the 2017 NFL season. 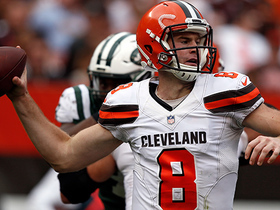 Cleveland Browns quarterback Kevin Hogan finds wide receiver Ricardo Louis open for a 20-yard gain. 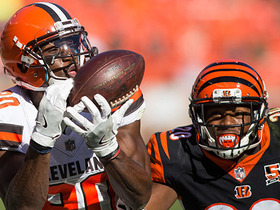 Cleveland Browns wide receiver Ricardo Louis caught a stellar pass from quarterback Kevin Hogan, before being pushed out of bounds by the Cincinnati Bengals. 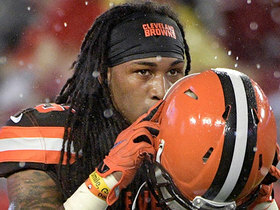 NFL Network Insider Ian Rapoport and NFL Network's Mike Garafolo share details on why the Cleveland Browns chose to release safety Calvin Pryor after his involvement in a fight. 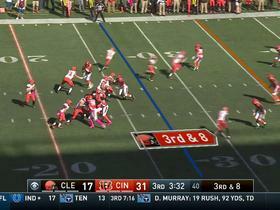 Cleveland Browns quarterback Kevin Hogan intercepted on 3rd down but offensive lineman Austin Pasztor recovers the fumble.